Adwords message extensions are a new site link extension that gives ad visitors the option to send an SMS text message from their mobile device directly to businesses. 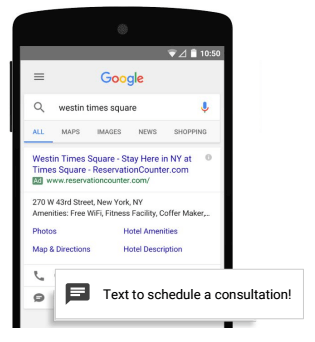 With one tap, consumers are now able to contact advertisers to book an appointment, get a quote, ask for information, request service, etc. all very quickly without the use of the website, email, or a phone call. Message extensions can be implemented at the account, campaign, or ad group-level and are currently supported in most countries. Adwords message extensions can help you grow your business by giving people another option to reach you as customers connect with brands and services in many different ways (website, app, phone, in-person, message). The on-the-go mobile consumer doesn’t have a preferred way to connect with businesses. They normally use the most convenient channel for them at the moment. and current best practices to have at least 4 active ad extensions per campaign or ad group. Message extensions can be found in AdWords by navigating to Ad Extensions > Message Extensions > + Extension > New message extension. Then simply enter in the required fields (screenshot below). When someone taps to send you a message, the message text will pre-populate in their messaging app. If you are ready to start or have questions about Adwords message extensions, contact your Smartz team or call us today to get started. And yes you are right Adwords message extensions can help you grow your business. Nice Blog.and very helpful information.